They say the third time's the charm, but the show's actually called Charmed, and everyone agrees it's #1, so that can't be right. 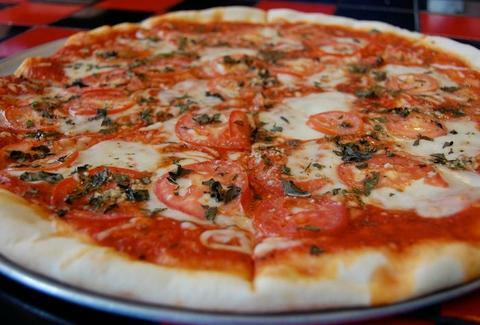 Proving the third time is a charm when it comes to pizza: Fatty's Corner Pizzera. Opened by three NY transplants, this pick-up-your-pie-at-the-counter-style joint's slinging un-fussy hand-tossed pies made with ingredients fresh from the produce market/deli next door, and in just one size, all in a spot art'd with NYC-centric pics, boasting a smattering of two-tops and counter-seating in a utilitarian storefront that's housed two other pizza places -- meaning, to be perfect, it's going to need four guys, and two girls. Fatty's will do made-to-order 'za but they've also got signature East coast faves like the ricotta/mozz/broccoli/garlic/no-marinara White Pie, the Fatty's Sausage, Peppers & Onions w/ a sesame seed crust, and a Chicken Parmesan w/ mozz, breaded chicken breast & Grandma's Red Sauce, but not Grandma's Red Scare, since that just comes with blacklisting. Other Italian-ness includes sides (twisted bread Garlic Knots), pasta (mozz/ricotta House Ziti), turnovers (stromboli, calzones), and sub-style sandwiches called Hot Bombers (so.. the cast of Showgirls?). Fatty's also offers up select pies by the slice and, if you live within 25 blocks of their location on Greenwood and Holman Rd, they'll even deliver, proving that you really are living a charmed life, except that you live within 25 blocks of Greenwood and Holman Rd.